A similar device, called the Mi-Fi, has been around for a couple of years, but those are 3G only. The 4G Mi-Fi is coming soon. Without getting unnecessarily technical, we are talking about the technology that Cellular communications companies use to deliver wireless Internet connectivity. The ‘G’ stands for ‘Generation’ so 3G is third generation technology and 4G is fourth generation technology. 4G is better. It’s faster and it goes farther. That’s the good news. The bad news is that it exists only in limited areas. Below is Verizon’s coverage map, 4G is represented by the dark splotches, the red is 3G coverage, and the white is no coverage at all. Read that as 9 1/2 Megabits/per second. A really good 3G speed would be 500Kbps – that’s 500 Kilobits/second, or 1/2 Megabit/per second. We were browsing the Internet at 20 times normal speed! We never wanted to leave. This was not only 4G, but it was extra fast 4G. That’s just over 1/4 Mbps! Our spot in Franklin, Tennessee is the poster child for why you want a new 4G device. With it, using the Internet was a joy. Without it was torture. In the Tortoise and the Hare, the blazing fast bunny runs out of energy. With our blazing fast 4G Internet connection, we quickly ran out of our data allotment. Our mobile hotspot device was on a $49/mo plan for 5 Gigabytes of data transfer. After one week and 4 Gigabytes of usage, we changed our plan to the $80/mo for 10 Gigabytes of data. Today, May 28, we’re at 9.88 Gigabytes. We’re in Ohio now, outside of any 4G area and we’re using our 3G Droid cellphones, tethered to our computers for Internet access. 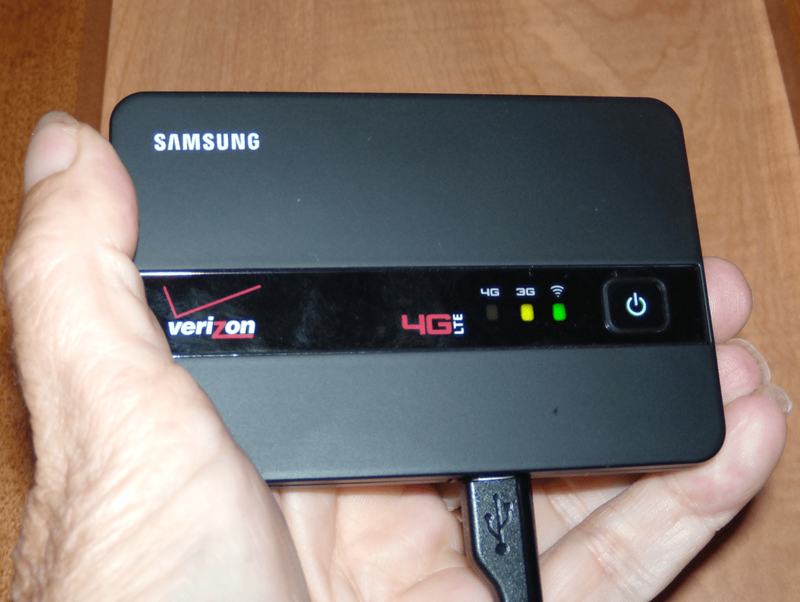 Verizon’s penalty for going over our allotment really isn’t too bad – $10/Gigabyte of overage. If we were still in the good 4G area that had lousy 3G, we would probably pay the overage. If you’re going to buy a cellular wireless Internet device now anyway, why not get 4G as long as it also does 3G? Notice the lights in my picture above of our mobile hotspot – there’s a 4G indicator light as well as a 3G indicator. If it can’t find any 4G signal, it will connect with a 3G. If you have a 3G only device – you’ll be very disappointed in Franklin, Tennessee! If you aren’t already planning on buying such a device, then it’s a harder decision. Is it worth upgrading when 4G is still so rare? Pay close attention to the coverage map for your provider before deciding. Geeks like us just gotta have it! Don’t take any speed test, or anyone else’s (even ours!) experience as gospel. Speeds vary from minute to minute, mile to mile, and computer to computer. This story is useful just to let you know how drastic the speed difference *can* be between 3G and 4G. Published by MrsGeek, in Blog. Tagged with 4G, Geeks on Tour, Verizon. Is there a thread on Geeks on Tour (GOT) about the AT&T plans and devices? We’re locked into AT&T for 2 years, as I upgraded to an I-Phone a few months ago: ouch on the change from my 9 year old plan. Chris is a rodeo clown. We were in Franklin for the 56th Annual Franklin Rodeo. We’ve been at the RAINY and STORMY FMCA G.L.A.S.S. Rally this weekend and are strongly considering coming out of the dark ages with our internet connection. (Still have those really old cell phones and the America’s Choice Verizon plan with unlimited minutes and SLOW connection). Wish you had been here to give your seminars! We did spend a lot of time with the Verizon guy that was here, though, and had also spent time at the store in Casa Grande last week before we left. The store was pushing the tablet connection (sort of like an I-pad) but the guy here was pushing your new toy..which at the moment looks like the best deal to us. One of my questions is would we be okay with the 5G plan? We have 2 laptops, never watch movies, but do read a lot of blogs. We watch video clips if somebody like you or our son posts something of interest. Almost anything we change to is going to double our Verizon bill, so Tom is not happy about that!